I'm one of those they call "Flexitarian". I consume more vegetables but I eat meat on occasion. It happens when we go out to eat which doesn't occur often. My daughter is the same way but my husband is a full-pledged vegetarian. Clearly he have a huge influence on my diet. Now living on a diet that calls for more veggies than meat have its disadvantages. No, not on the health benefits side of it but specifically its storage. Vegetables easily spoils when not properly stored or not used quick enough. It turns into waste and translates to more money wasted. If you are faced with the same issue "like I used to do", then you'll want to know these simple ways that's worked magic for me! 1. Paper towel - This is my secret weapon. You probably didn't think a common paper towel will do the trick but it does. By protocol, our store-bought veggies are placed inside plastic bags. If you are like me, most of the time, I don't take the veggies out of them as soon as they reach home. By habit, it's easier for me that way. They go straight in the crisper. But not anymore! I've discovered that placing 1/2 a piece of a full sheet of paper towel is enough to absorb 99% of the moisture inside the plastic bag which in turn extends the life of a vegetable longer and delay the rate of spoilage. Works best with Green Beans, mushrooms and leafy ones. To make it work, you have to make sure that a part of the paper is loosely on top of the vegetable and placed halfway down the bottom of the bag. 2. Poke A Hole - Let's face it, life is a rush and if you are unable to do the paper towel trick, poke holes right around the sides of the plastic bag to give moisture an escape route. Don't seal the top tight. Leave them loose. 3. Unwrap and wrap - Some vegetables are best out of the plastic bag. Scallion or onion leaves, Napa cabbage and leafy ones are an example. After taking them out, wrap them with paper towel and you're set. 4. Bare Naked - Hardy vegetables like a head of cabbage, broccoli or cauliflower are better off "naked". They lasts longer outside a plastic bag and without the help of a paper towel. But if they must stay inside a plastic bag, make sure to poke holes on the plastic. 5. Partner with Onion - If you don't know yet, Onion is rich in sulfur which is the base chemical used in preserving certain manufactured foods. With Onion's rich sulfur content, you can use it as a natural preservative. I cook a lot with onions so I always have one that's cut up and handy. I would partner the unused portion with vegetables that easily spoils inside a plastic bag or containers. Bell peppers are one of the usual partners. 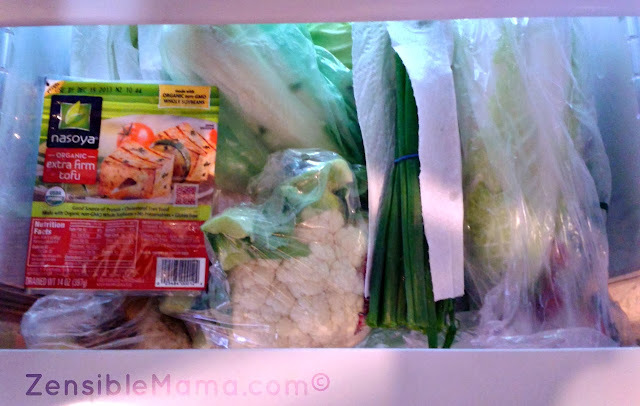 A look inside my crisper. Don't mind the tofu. It's a "vegetable" so it's in the right place! Bonus tip: When storing your veggies, make sure the hardy, heavy ones are at the bottom of the crisper and those that are more fragile and delicate stays on top of the pile. Problem with Tomatoes' life expectancy? Ask me. I've got an answer for you. 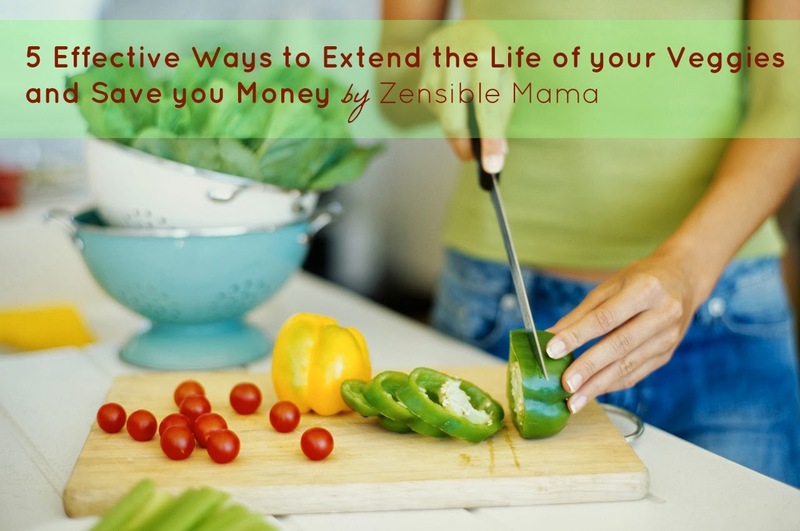 Personal testimony: "Since I started doing these tips, my waste ratio have diminished dramatically. I can't remember a week where I have to throw one veggie due to spoilage. And that's a good thing. I'm getting the most of my money's worth each and every week!" Start paper toweling and start saving! May the power of paper towel be with you!